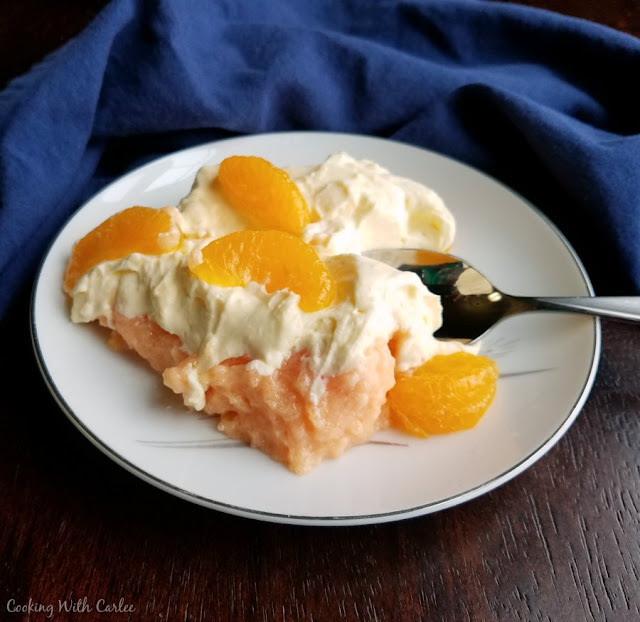 Creamy orange jello dotted with mandarin slices and topped with a fluffy vanilla topping makes for a perfectly refreshing and delicious orange creamsicle jello salad! I have been having a lot of fun cooking what I would consider vintage recipes lately. So I tried to get some ideas for fun new things to try on Facebook, when the conversation turned to what qualifies as vintage? What would you consider a vintage recipe? Jello salads scream vintage to me. 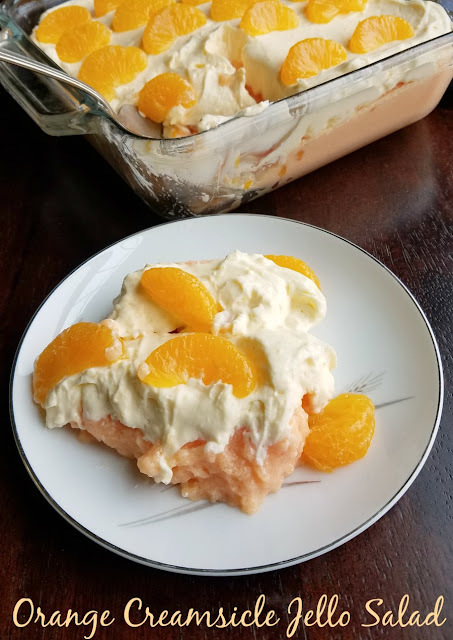 So I thought I would make a fun orange creamsicle inspired jello salad in celebration of my (not so) newfound love of old recipes. Ever since I remade my great-grandma's green jello salad recipe, I have been hankering to make another. I mean jello salads are just so fun! Plus I feel like the fact they are called a salad makes them just a teency bit healthy. Hey, a girl can dream! Add to that the fact that there has been a bit of crud going around here lately. I'm sure part of it is the weather change and part of it is the fact that there is influenza B and strep making the rounds. Little Dude was the latest victim to the flu bug. Luckily he seems to be bouncing back now, but he had a few really sad afternoons and evenings. I hate seeing him sick, but I did soak up all of the extra cuddles while I had the chance! All of this to say that my husband thinks jello is a necessity when you're sick. It was one of the first things he asked when Little Dude presented with a temperature. "Do we have any jello to make him?" Of course I couldn't just make jello. So I took inspiration from that green jello salad and made and orange version with mandarin oranges. While we were going that far, it seemed only right to top it off with creamy vanilla goodness. 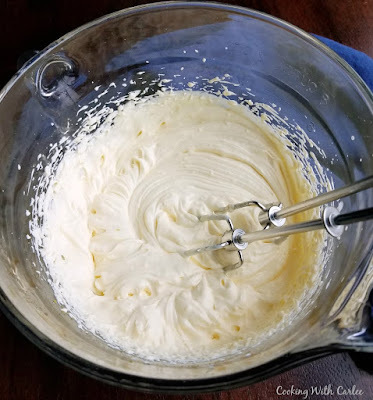 A little bit of super strength vanilla pudding (made with less milk than the box calls for) and some cream whipped together did the trick very nicely. A proper jello salad needs a bit of garnish. 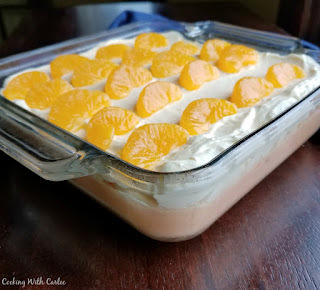 So I placed a few more mandarin orange sections on top and a true new vintage recipe was born! I am sure that's how it works, right? In addition to jello salads, recipes like scalloped corn, SOS and even some tuna noodle casseroles scream vintage to me. What kind of recipes would you consider vintage? Do you have any favorites? Stir orange jello packets into hot water until dissolved. Add to cream cheese and mix until as smooth as possible. Drain one can of orange slices and stir into jello mixture. Pour into a greased 8 or 9 inch pan and refrigerate until set, at least two hours. In medium mixing bowl, stir instant pudding mix into 1 cup cold milk. Refrigerate for 5 minutes to set into a really thick pudding. Using a mixer, beat the pudding. While the mixer is going, slowly drizzle in the cold cream. Beat until light, fluffy and it holds stiff peaks. Spread over set jello. Drain the second can of orange slices and arrange over the whipped cream. Serve and enjoy! Reminds me of my Orange Fluff but how I love your pretty layers, I just mix mine all together, lol. Your presentation us so good and this looks so refreshing!! Happiest weekend sweet friend! I need to try your fluff next! Thank you! Carlee, Jello Salads were the bane of my childhood! I guess that makes me vintage, too, haha! I would try this one because I loved push-ups, or creamsicles as they're called now. I don't think I'd go within 10 yards of one of those green jello salads, tho!! HA! You aren't vintage at all and now I am craving a push-up! Oh no! Now I see your Great Grandma's Green Gelatin Salad to the right under popular recipes! Oooops! Hi Carlle, I love the fact that this is called a salad. That's an interesting way to dissolve jelly crystals without using unwanted liquid. There was an association about jelly and being sick in this house too. Not so much the chidlren are no longer children. Hope your little man is 100% soon. He is feeling much better already. Thank you! It definitely has a retro flare, doesn't it? But it was sooo good! I've always loved the version of this jello salad that my mother made. I definitely think of Jello as being vintage. We had it in many different varieties during my childhood days. I haven't had many versions, but now I am curious to try more. I've been having fun playing with them lately! Mmmmm... Yum! I think my moms vintage version had cottage cheese in the mix, I'll have to see if I can find that recipe. You are going to have me going down memory lane all night now! And, picking up some orange jello when I go shopping this weekend! Oooh, I'd love to see your mom's. I can see cottage cheese! Do share if you find it! Had to add the pretzel crust under it, from my Mom’s jello. Sprinkle the stick pretzels on the bottom of the serving dish, pour a little melted butter and sugar, bake for about 10 minutes. Now you have sweet and salty that I love. A pretzel crust is genius! I can't wait to do that! And I love both! Thanks! I consider anything that I remember from my childhood that you don't see much anymore as vintage recipe! 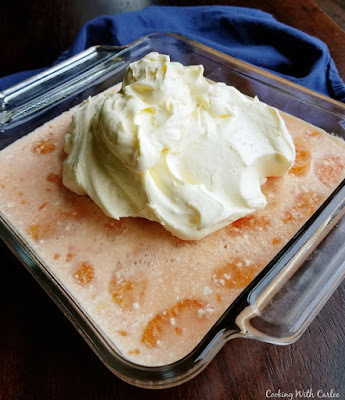 Also, the creamsicle was really popular when I was young (and was my dad's favorite), so this was perfect to combine with the jello salad concept!